Sitting in the car on my way back home. I did not finish the 3rd stage. After the second climb I crashed. I was in third position going down the descent. The rider in front of me crashed. I usually have a few meters safety distance to the next rider so I have some time to react if something happens. This time the few meters did not help. The rider in front of me crashed and his bike flew up on the road again. So I could nothing else than ride into it. A few more riders rode then over me and crashed, including Elisabeth Brandau. I got up, noticed me left knee was aching a bit. I had hit it, but no blood, so everything fine I thought. Elisabeth seemed to have some problems with her bike. I did not want to continue before she could. That would be unfare against her. I waited for her as she checked her back wheel during that I had time to check my own body. As I did that I almost got hysterical as I saw the long and deep wound on my calf. Jan from Team Texpa Simplon came up to me and asked me to lay down and tried to calm me down. Elisabeth had a first aid kit with her and they made a bandage around my calf. As I was lying there on the ground I noticed how some women passed us. No sportmanship there. So I told Elisabeth to continue. From Elisabeth a wonderful gesture helping me and giving me first aid. I will never ever forget that! Another guy, Falk, biked up on the top to get some help. Jan stayed with me and soon I had two paramedics there. They came with motorbikes, very proefssional! They made a wound dressing, and gave me an i.v. drip. Now I just had to wait for the helicopter to pick me up. It arrived, but there was no space for it to land. That meant for me to be packed in a ,bag, and be lifted up. Scary, but I had to trust the people doing it. Still I was happy to be inside the helicopter after hanging in the air for a while and watching the rotorblades. In the hospital some x rays were made and finally the wound operated on and sewed together. I am pretty empty in my head at the moment. I will never forget the people who stayed there with me and helped me. 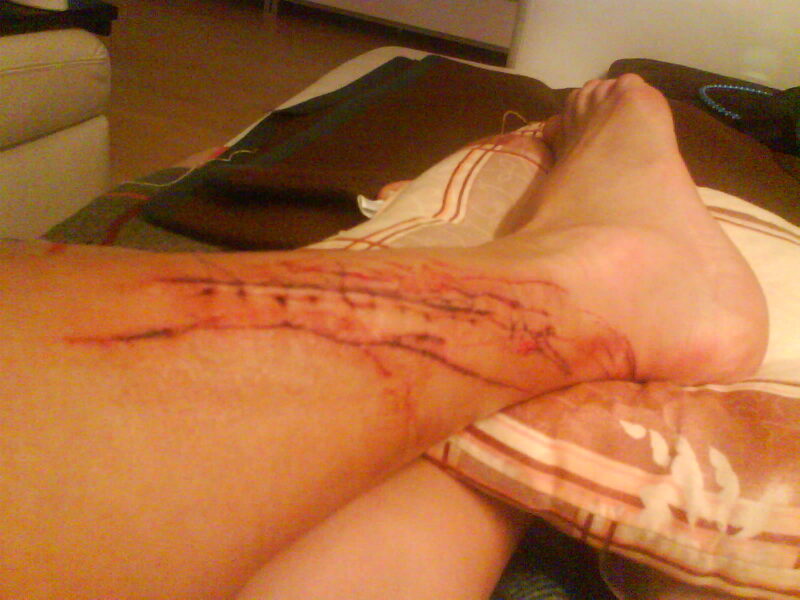 It was a hard moment, as I did not know how badly I had injured my calf. Having this support out there in the mountains, people talking to me, holding my hand and just trying to calm me down was and is worth a lot to me. Thank you!